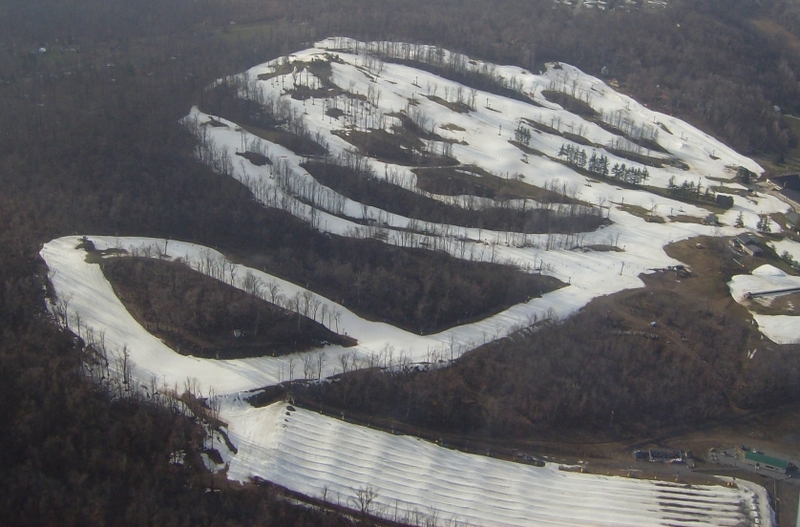 Mad River Mountain demonstrates the snowmaking power that not only makes Ohio skiing viable, but pretty darn good! Specs: Summit elevation: 1500′; Base elevation: 1260′. 6 Lifts: 1 quad, 1 double, 4 surface. Uphill Capacity: 6500/hr. Terrain Mix: 33-34-33. Longest Run: 2000′. Season: usually December through March. Night Skiing 7 days. Rentals. Annual Snowfall: 120″. Snowmaking: 100%. The SKInny: This ain’t Utah, heck, it ain’t even Pennsylvania. Nonetheless Alpine Valley does a good job moving people up the hill at a reasonable price. Nothing too difficult, but certainly some challenging trails as midwest skiing goes. Well run operation. Specs: Summit elevation: 1465′; Base elevation: 1290′. Two surface lifts including T-Bar. Terrain Mix: roughly 25-50-25. Open 7 days, some night skiing. Annual Snowfall: 100″. Snowmaking. run through the trees; how can you beat that. Signature Trail: Show Off. Double black is called Zot. Specs: Summit elevation: 660′; Base elevation: 420′. 16 Lifts: 4 quads, 5 triples, 2 doubles, 5 rope tows. Uphill Capacity: 16,000/hr. Terrain Mix: 23-27-50. Longest Run: 3,520′. Season: usually December through late March. Night skiing 7 days; open til 1:00 am weekends. Rentals. Annual Snowfall: 60″. Snowmaking: 100%. The SKInny: The name of the game here is “technical practice.” As anywhere in Buckeye country, the runs are not long enough to cut loose and enjoy the overall skiing experience. So you find an uncrowded slope and practice some aspect of your game, and work it. Then you ride the lift back up and work it again. The gentle mogul slopes are a fine example; they’re ideal for developing skiers to practice, practice, practice. Wanderers at heart can shuttle between the two hills (a couple miles apart) for a little more variety. BMBW takes a hit for impersonal service — thing to remember is that this is essentially a suburban ski area covering two hills, and that it will not have the same atmosphere as a mountain resort. Specs: Summit elevation: 2400′; Base elevation: 2100′. 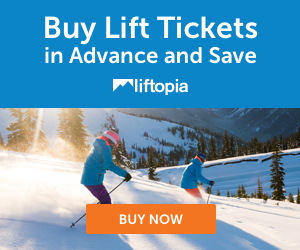 6 Lifts: 1 quad, 1 triple, 1 double, 3 handle tows. Uphill Capacity: 4200/hr. Terrain Mix: 29-42-29. Longest Run: 1800′. Season: usually mid-December through mid-March. Night Skiing 7 days. Rentals. Annual Snowfall: 75″. Snowmaking: 100%. The SKInny: Clear Fork may just be the best of the Buckeye operations. It’s certainly the one that “feels” most like a New England ski area. That’s a bit of a stretch, I admit, but the trail layout, wooded runs, etc. are a nice change from the usual wide open lump style that permeates the region. Service is excellent. Specs: Summit elevation: 1460′; Base elevation: 1160′. 7 Lifts: 1 quad, 1 triple, 3 doubles, 2 surface. Uphill Capacity: 6,200/hr. Terrain Mix: 22-34-44. Longest Run: 3000′. Season: usually December through March. Night Skiing 7 days. 3:00 am closing on Fri & Sat. Rentals. Annual Snowfall: 36″. Snowmaking: 100%. The SKInny: A Mad River of people on a small vertical with no challenging terrain. But hey, beggars can’t be choosers. If you can hit it on an uncrowded time you can enjoy what are relatively long runs in this part of the country. Specs: Summit elevation: 1475′; Base elevation: 1175′. 6 Lifts: 4 triples, 2 doubles. Uphill Capacity: 8,650/hr. Terrain Mix: 20-60-20. Longest Run: 2000′. Season: usually December through mid-March. Night Skiing 7 days. Rentals. Annual Snowfall: 60″. Snowmaking: 100%. The SKInny: Read any one of the reviews above, and on any given day any one could apply to any of the ski areas listed here. They make a lot happen in a (relatively) small amount of space, little trails and connectors make it feel like a bigger area. What Snow Trails lacks in size it makes up for in spirit; this is probably the most “resortish” atmosphere in Ohio. Older wood lodge really makes you feel like you’re in a mountain town somewhere, rather than Ohio farm country. It’s pretty cool. And the people are nice. Spicy Run Mountain has currently suspended skiing operations.